Spring in Boston deserves a post every year, for no matter what the winter has held, be it a snow fall of 85 inches or dreary rain and cold grey, spring in all its glory casts a spell on the city. Yesterday was a balmy 70 degrees with hardly a cloud in the sky and today promises more of the same. Forsythia and crocuses are the first to bring the promise of warmer weather and are a welcome color against the dead of grass and limb. Soon after come leaves of hedges and other perennials, added to the landscape the way an artist dips their paintbrush into colors of paint and with broad strokes creates color out of nothing. The banks of the Charles River enjoy foot and bike traffic, as people emerge from the cocoons of their dorm rooms and homes to breathe deeply and feel the warmth of spring. Everyone thaws. Who better to bring us thoughts of spring than the poet e.e. cummings, native to this area. e.e. cummings was born in Cambridge and we have driven past his house many times. He went to Cambridge public schools, graduating from the same high school that my two youngest children have attended. Author of thousands of poems as well as novels, essays and plays, e.e. cummings had a magical way of weaving words and creating poetry. As temperatures rise and spring becomes official I’ll leave you with the magic of spring as expressed by this lower-case poet. I too love spring. 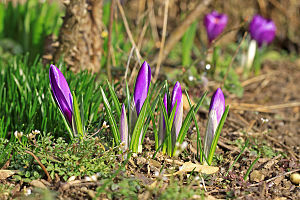 I think the new year should start on the first day of spring. It is a new day, anew opportunity, everything is new and we begin again. I agree! I love that Nowruz or Persian New Year begins in the spring on the 20th of March. We love it when we are invited to Iranian Nowruz parties – a great celebration. Happy Spring to you Maggie! Thanks for coming by and reading this SueAnn. More so, for caring enough to comment. Here’s to the wonder of spring! absolutely! Have a great spring! Isn’t the poem great?! I remember hearing it once or twice before – but seeing it made a difference for me. And I saw you posted the poem on Facebook – yay! The poem you quote is one my dad said as well. My dad loves poetry and writes a poem for Christmas yearly.